Panda Free Antivirus protects you while you browse, play or work and you won't even notice it. It is extremely light as all the work is done in the cloud. Panda Free Antivirus provides you with the fastest protection against the newest viruses thanks to its cloud-scanning from PandaLabs' servers. It is truly install and forget. Don't worry about updates, configuration or complicated decisions ever again. So impressed with this I've ditched ESET & now use the pay version of Panda, light on resources & very configurable along with good interface. Gets good results on AV tests. Great program. Although I use ESET SS on my main PC I have been most impressed with this running on a second PC - Most reviews of this AV have been excellent & IMO you wont go far wrong with this as an AV solution ! P.S - My girlfriend got pregnant soon after installing this product so beware & if you use Panda take proper & reinforced precautions. Once again CyberDoc999 reviews something so low, that I rate so highly. In the AV tests I have read, this software has consistently been rated exceedingly highly and I have to say, out of all the free AV products I have tried I have found it the best to use, both in terms of ease of use and performance. This is a very good antivirus and it does not have a low test rating at all, it is one of the highest. Some of you write this junk here and you have no idea what your talking about and you do not help anyone by doing that, it just shows how foolish you are. I have no problem with Panda at all and if you go look at their test ratings, they most certainly are far from the worst. Grow up. @CyberDoc999: I don't know where you get your benchmarks from but that's NOT TRUE (what so ever) and just because you don't know how to use an application doesn't mean it's not a GOOD product. Stop writing useless reviews. 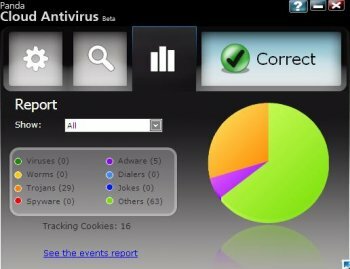 Its actually one of THE BEST FREE AVs and beat Kaspersky in malware blocking and malicious URL blocking test. Actually USE and RESEARCH a PRODUCT before posting a negative review. Also the PRO version is an excellent product, they even have a 6 month free trial available. Note: The interface shown is from a previous product. In any event, I'm glad that I switched, as Panda has so little impact on my system's performance that it's almost like having no antivirus program installed at all: my computer starts quickly (with no warnings or errors on my Event log), programs launch/open quickly, and files open/load quickly. How well Panda is protecting my system, I haven't a clue, but it tests well in the various antivirus tests I've seen on the Web. Panda is easy to install and setup and allows the user a reasonable amount of control over the settings. Big items include customizable scans, a scheduler for scans, and exclusion lists. The Update feature is automatic, and I don't believe that it can be turned off(? ); there's also an on-demand "Update now" button. I'm guessing that "updates" include both virus definitions and program updates. Major features -- Real-time protection, Process Monitor, and USB Vaccine -- can be turned on and off individually, as can many smaller sub-features. The Windows 8-ish control panel GUI is more designed for fat-fingered users of touch screens than for handsome, erudite users of "classic" desktop PCs, but it's straightforward if not very elegant. Power users will no doubt want more control, but Joe Average users with slight geekish tendencies will likely be happy enough. Also, I haven't noticed any pop-up ads or anything of that sort ... only some notes/links on the control panel encouraging me to upgrade to Panda Antivirus Pro (which adds a firewall and Wi-Fi protection). I signed up for a Panda account, but I'm not quite sure if that's required or not -- the program seemed to work fine before I signed up. Signing up requires an e-ddress and password but nothing else, though Panda does politely ask for your name, address, phone number, etc. (which I did not provide). I haven't received any junk mail from them yet. I've tried out many of the well-regarded free antivirus programs -- AVG, Avast, BitDefender, Comodo, Panda, and one or two others -- and Panda is clearly the least performance robbing of the bunch on my machine. BitDefender is pretty good while it works, but it's a bit touchy and quits auto scanning after a week or so on my machine -- though it works without a hitch (and has for over a year) on my dad's newer Windows 7 machine with SSE2+ CPU. AVG, Avast, and Comodo slow my computer quite dramatically, with even the simplest things (opening the Start menu or Windows Explorer or Notepad) being annoyingly delayed. I suspect that my ancient CPU's lack of support for SSE2 and above may be the problem in some of these cases, as a lot of newer software works better with, or even requires, a CPU with SSE2+ support, so users with a newer CPU may not encounter these problems. Cons: No cons except Cyberd***999 has lost the plot again. Avast! Free Antivirus 2015 is one of the best Security Software. This Software simple user friendly interface. User can easily access the tools and key features from customizable homepage. Before few months, I was installed from SoftMozer. BIG improvement since my last review. Manual scans work fine now. Get alerts when virus(test file) is found. However, the alerts are not quite immediate sometimes, with the file going to quarantine and getting an alert up to a minute later sometimes(mostly if doing a couple files nearly simultaneous together). This AV is VERY, and I mean VERY LIGHT on the system, and believe me, I've tried many others in the past. I now use this paired with Malwarebytes paid version and free Comodo Firewall, along with 'Excluding' Panda and Malwarebytes from monitoring each other, among other files and processes in the background I know will always be safe, like WinPatrol(paid version). Kudos to Panda for coming up with an AV app that I can FINALLY be happy with, and the best part is, this one's free. Hopefully they don't mess up a good thing, at least for a few years anyway, and given today's constant version updating cycle with software, that might be asking for a lot. If you do have trouble installing with the web installer, it will then have you download the offline file. Also note, it does ask to make Yahoo the home page among a couple other things, and as per usual, best to uncheck them before proceeding to install. Updating my review with the new 3.0 version. The new version sports a new UI but loses a lot of features from previous free versions like Data Shield and Parental Control. Surely these will be included in the pay editions, which is business, I can't really complain. So now the free version is *very* basic, similar to Bitdefender Free or MS Defender.